Create a inviting breakfast nook that your family will enjoy using every morning. This area of your home has a certain nostalgic appeal. Use themes, color, style, and design to make it a comfy morning retreat that ensures a great start to your day. Bring a little bit of the sea life into your breakfast with a beach look. 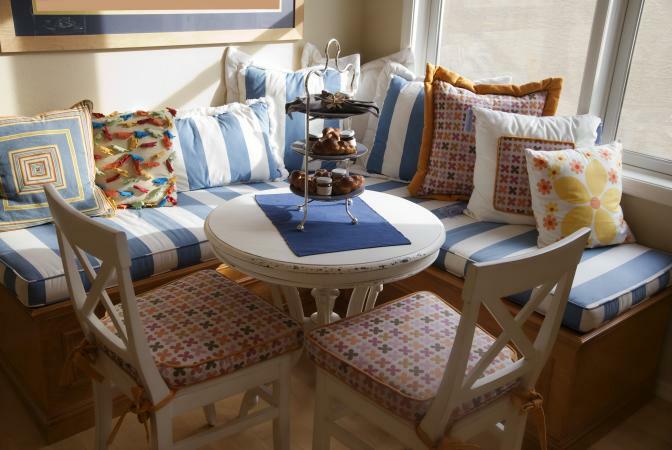 This breakfast nook (pictured above) is styled with a marine blue and white striped cushion and same fabric throw pillows. Other sea colors are added to the nook with gold, blue and tan colored fabrics. The chair seat cushions are made from the same fabric of a few pillows to bring the chairs into the designer look. Set a solid marine blue placemat in the center of the table for showcasing the desert centerpiece. Wall art: Use various wall art, such as beachscapes, sailboats, sand dollars and star fish shadowboxes and mounted pieces of driftwood. Wall sconces: Select a pair of wall sconces made of capiz or with nautical shades. Other lighting choices: A beachy chandelier, recessed lights and even a table lamp placed on an end table or window sill add a warm ambience. Mission: The furniture style features horizontal and vertical lines created by flat panels and typically made from oak. The wood grain is part of the beauty of this design. A good choice for Arts and Crafts and Southwestern decors. Also use for rustic or lodge/cabin home décor. Use earth colors, such as green, gold, brown and red. French Country: Antique white finished furniture, fauteuil armchairs, or country rustic are good choices. Choose floral and plaid patterns for upholstery, pillows and draperies, rooster and/or fleur-de-lis motifs, candles, brushed nickle with frosted glass light fixtures and springtime colors. Use table linens, such as a plaid tablecloth and matching napkins or a provencal pattern. Victorian: Bay window seats were very popular. Use dark or antiqued finish table and chairs ornately decorated, such as the Rocco style with upholstered dining chairs often displaying tufted backs. Walls can be painted, stenciled and wallpapered with birds and pastoral scenes. Color palettes should be three color combinations. Popular colors included, muted mustard yellow, seafoam teal, plum, eggplant, lavender, deep red, burgundy and walnut brown. Add a bevel mirror, tapestry or needlepoint pillows with tassels or ribbon trimmings, an ornate wall clock and floor lamp and wall sconces with beaded shades. Choose from lace curtains, velvet draperies, wood blinds, cornices and valances for window treatment. Some breakfast nooks aren't actual alcoves or extensions of the kitchen. Some are barely defined spaces, such as a bay window in the kitchen or as in this photo, part of an architectural design. Kitchen breakfast areas that are little more than a small extended space in the kitchen can be played up. Use space designators, such as adding a ceiling architectural feature. Ceiling medallion: Many big box hardware stores or architectural restoration websites offer wood, resin and plastic designs. Beams: Faux or wood beams can be added to the ceiling. Boxed ceiling: Faux or wood boxed ceiling panels can transform this space into a cozy nook. Tray ceiling: This architectural feature adds a wisp of romanticism to your breakfast area. A bay window is a wonderful architectural feature that can designate a specific area, such as the breakfast nook. Whether your bay window is standard or a customized curved feature like this photo, you can repeat the shape with seating options. 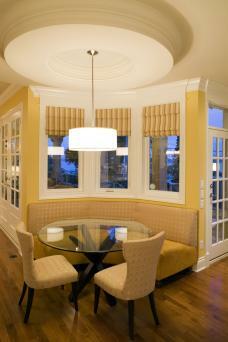 This customized gold banquette fits and emphasizes the window curve. A glass-top table keeps this area from becoming too design heavy. 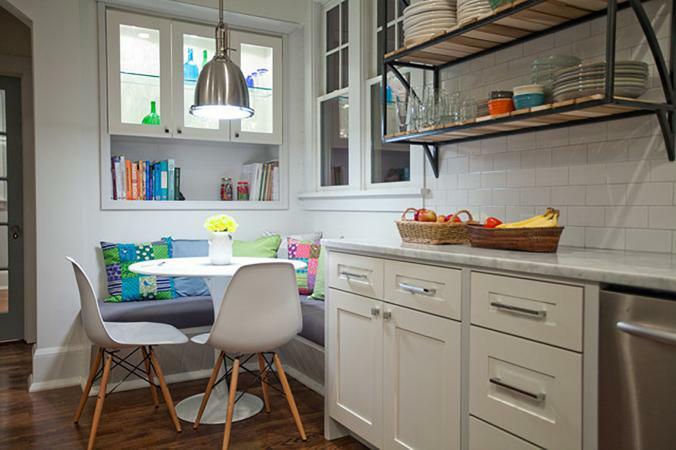 Smaller kitchen are ideal for carving out a nook in a corner. This photo is a prime example of how a space can be reclaimed and used for a breakfast nook. You can reclaim a corner that perhaps you've placed a small cabinet or sideboard. Round table: A round table is space saving choice and breaks up hard angles. Colorful pillows: Add lots of colorful pillows to brighten up the corner. Bench cushion: A thick cushion covered with the right fabric choice continue your color scheme. Chair choice: Go with a chair style that accentuates your design but also is proportion in size to the space and table size. Shelving and built-in cabinets: Replace the door of a corner built-in cabinet with glass ones, add recessed lighting and fill with colorful objects. Lighting: Choose a light fixture that repeats the style of your nook, such as a large silver-colored modern pendant light. Style around your nook furniture to create a cozy little corner for breakfast. Booths are a very popular style, so come up with some fun ideas to accentuate them. Checkerboard effect: Add a black and white checker rug and strip of black and white subway tiles on the wall between the two booth seats slightly above table height. Wall art: Go with popular logo art, such as Coca-Cola, vintage signs, old posters of Chevys, a malt shop chrome clock and neon signs. Window treatment: Old-fashioned gingham, strawberry print or red/white striped curtains and horizontal blinds give an authentic feel. Light fixtures: Choose from vintage style lighting that includes, pendant and wall mounted gooseneck light fixtures. Table accessories: Set the table with a diner-table jukebox, napkin holder, salt and pepper shakers and soda style glassware with straws. 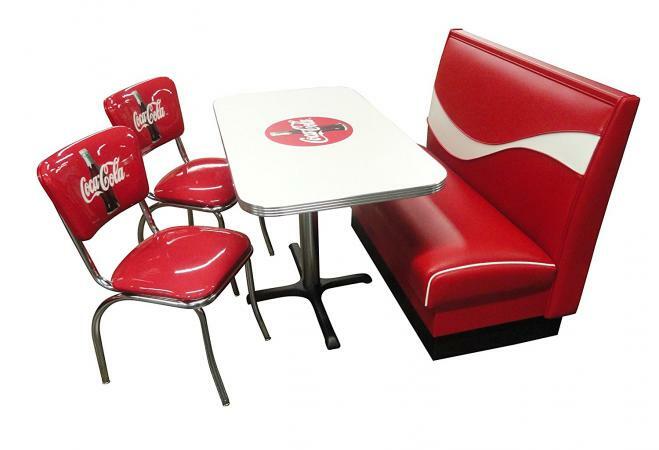 Most booth units come as a four-piece set. The set usually includes the L-shaped corner bench, table and two side chairs. Some sets feature an individual bench instead of chairs. The booth unit is typically made of wood although some have metal frames. Both styles will need a thick comfortable bench and chair cushions.You can purchase nook style furniture that is built to fit into most corner nooks. Booth style furniture saves space and offers a more intimate feel to a breakfast nook. For the best visuals, you may decide on the same fabric cover for the bench and chair cushions. In some instances you may use different chair cushions, such as matching these to throw pillows or a back cushion on the nook bench. The main concern should be finding fabrics that go together through color, texture, style and patterns. Throw pillows: Add a few plaid, stripe and solid colored throw pillows for a cozier ambience. Wall art: Choose art that repeats fabric and decor colors while fitting your overall kitchen theme. Light fixtures: Hang a silver-finished or a colored-glass shade pendant over the table. Add recessed ceiling lights. Side table and lamp: Set a small side table on one end of the booth unit along with table lamp. Part of the overall design for your dining nook is the table decoration. This includes a tablecloth, table runner or placemats. The table setting in the photo demonstrates how the furniture can influence the type of table setting. The colors reflect a coastal themes as does the furniture. An embroidered runner is anchored by untrimmed boxwoods in blue planters. 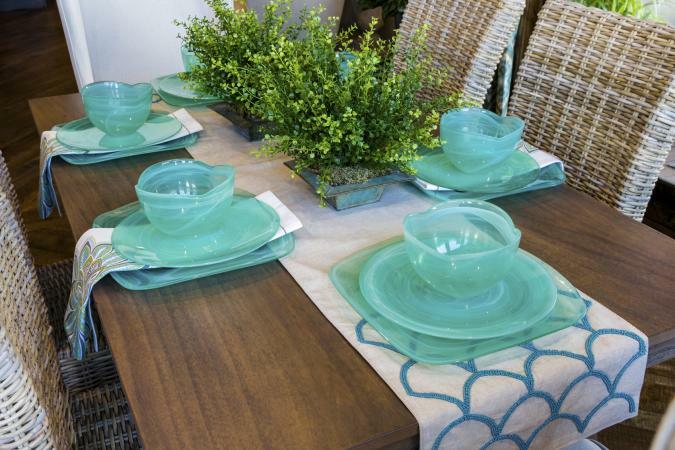 The coastal color scheme is continued with seafoam colored dinnerware. A unique peacock-colored embroidered linen napkins unite the various values of blue. A centerpiece is a great opportunity to add a great design element to your nook design. This can be a floral arrangement, a candle tray with three column candles, an apothecary terrarium, orchid or African violet or vases filled with colorful florist stones holding single silk flower stems. You could even place a bowl with fresh fruit that your family can enjoy for breakfast. A breakfast nook can enrich family life by bringing your family together before going separate ways for the day. With the right décor, you can enhance everyone's memories of breakfast and a shared time together.